PrestaShop users can finally take advantage of our leading Affiliate Marketing Technology which is now available as Affiliates Pro for PrestaShop, compatible with self-hosted and cloud-based installations. If you want to boost sales for your online business, Affiliates Pro for Prestashop supplies the right tools to implement the easiest to use and best Affiliate Marketing solution. 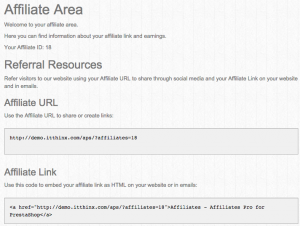 Using affiliate links to any section of the site. Using banners designed to promote your products and business. Using social sharing buttons for products. The system is integrated with the Social Sharing module for that purpose. To get an idea of how this works, let’s take a look at the referral process. Note that this can be used to track referred orders and pay affiliates their commission on orders, but also to refer customers, assuming that you allow affiliates to get a commission per new customer referred. Affiliates can promote the site and refer sales and customers using their affiliate links. A specific Affiliate Area is providing the necessary resources, including basic affiliate links and banners as well as performance and earnings statistics. An affiliate signs up to the affiliate program of your site. Alternatively, the affiliate is added by an administrator. The affiliate accesses the Affiliate Area to obtain her affiliate URL, link and banners. Potential customers view the information posted by the affiliate and click the affiliate’s link or banner. After clicking an affiliate link or banner, the customer places an order and the system recognizes that the order was referred by an affiliate. A referral is automatically recorded based on the order placed by the referred customer. The referral holds the commission amount credited to the affiliate and this is taken into account by the system when you request the accumulated totals for a given period to pay your affiliates. To purchase this module, visit Affiliates Pro for PrestaShop in the shop. Hi, I am evaluating this module and found it very impressive and consider to purchase it. I did try to use the affiliate link to order and it is shown in Back Office (BO) as Pending. May I know how can I change the referrals transaction from Pending to Approve as it does not allow me to update the transaction? We might want to evaluate the commission payout for the approved transactions before making our decision. Also, is there any report that i can generate to give to the affiliates? The referral status will be updated according to the order status. But you can set a default status from Affiliates->Settings. The affiliates can see their commissions from their Affiliates Area (in their account page, they have a link to access to this area). From ‘Totals’ section you can generate total’s reports. But, i am unable to find Affiliates -> Settings from the demo BO. Also, on this demo site, can you help me to set the order status for #30 and #31 to the status which entitles for the referral commission? I would like to get a feel on how the module works after referral has been approved up to payout the commission. This process is automatic according to the order status. Wonderful video presentation, but there’s no demo of product. Congratulations on the release guys! 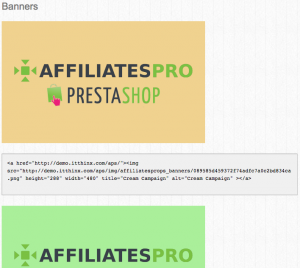 I was hesitating to move to Prestashop but now it seems our affiliates could survive the transition! I suppose this module does not allow for a multi-tiered affiliation system though, right?